CLEARWATER, Fla. (AP) -- Evel Knievel, the hard-living motorcycle daredevil whose exploits made him an international icon in the 1970s, died Friday. He was 69. Knievel’s death was confirmed by his granddaughter, Krysten Knievel. He had been in failing health for years, suffering from diabetes and idiopathic pulmonary fibrosis, an incurable condition that scarred his lungs. Knievel had undergone a liver transplant in 1999 after nearly dying of hepatitis C, likely contracted through a blood transfusion after one of his bone-shattering spills. 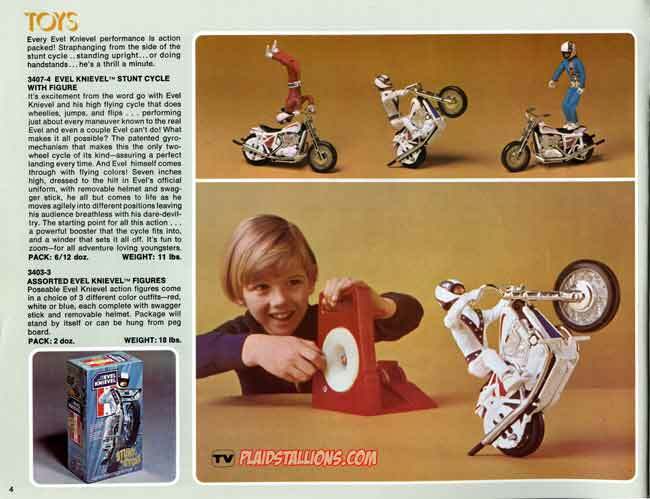 Ideal's Evel Knievel was one of the most popular toy lines of the early 1970's, by 1975 Ideal hoped to expand the line by adding adventure to it and of course bringing the girls in with Derry Daring. Click here to see the catalog. I got the Ideal Jaws game one year for Christmas, the movie itself made me to timid swim in the ocean, lakes and even pools. I never said I was a bright kid. 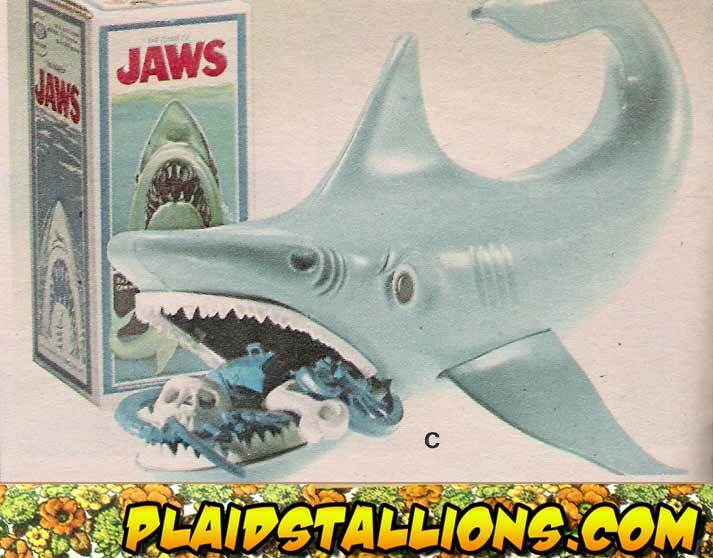 It was a pretty inventive game but I really only remember playing it once or twice before Jaws became a supervillain for my Mego Superheroes to fight. Great game but an even better action figure. Only a fool stands between them and what they want. Do you want to be Gage or Desoto? Detour Magazine (which is an awesome read BTW) published a cool little piece on yours truly today, as an added bonus they didn't use the picture of me I regretted sending in the first place. Life is good! Check out the piece here. 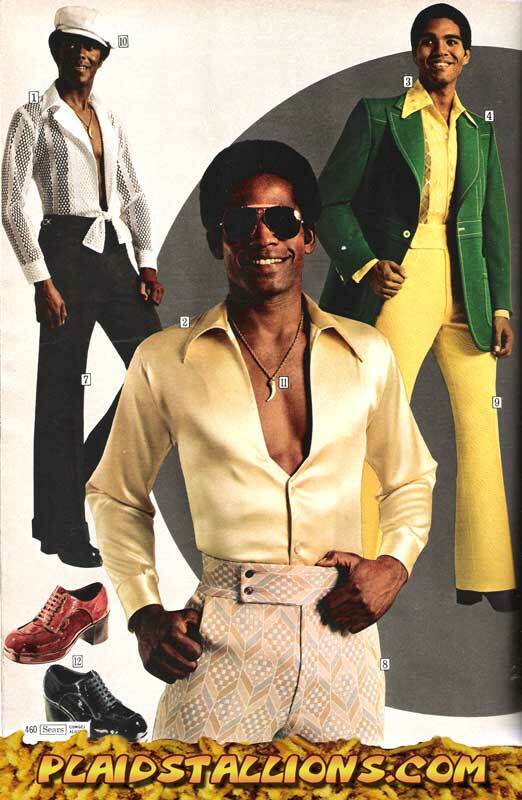 Not even your knickers were safe from 70's funk. 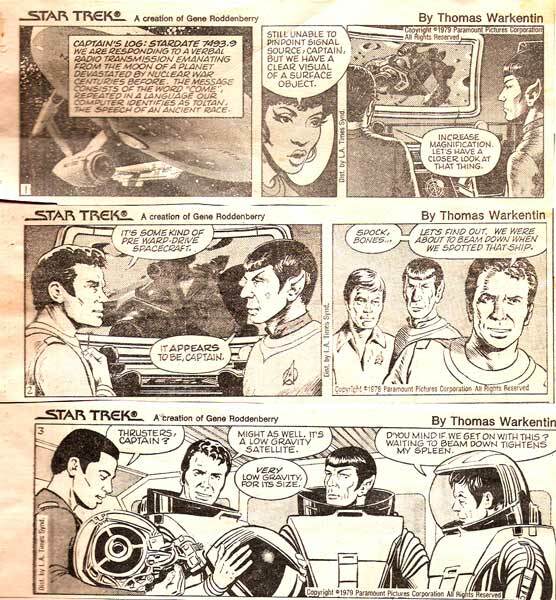 Continuing the slow moving syndicated adventures of the Starship Enterprise, I'll be keeping the previous entries on the site in a new archive. 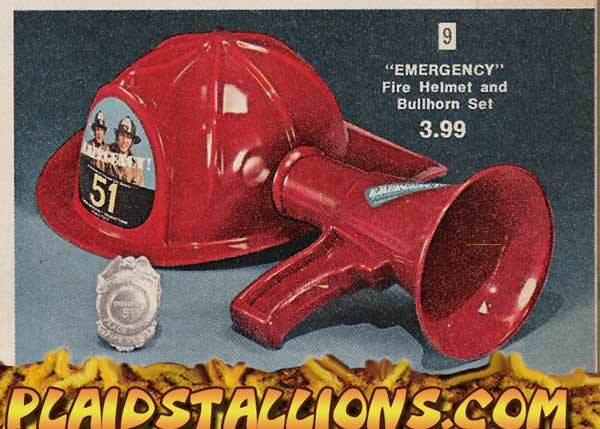 Spring Supplement Catalogs usually include things that didn't make it into the February Toyfair in a bid to make it out in time for the Christmas season. 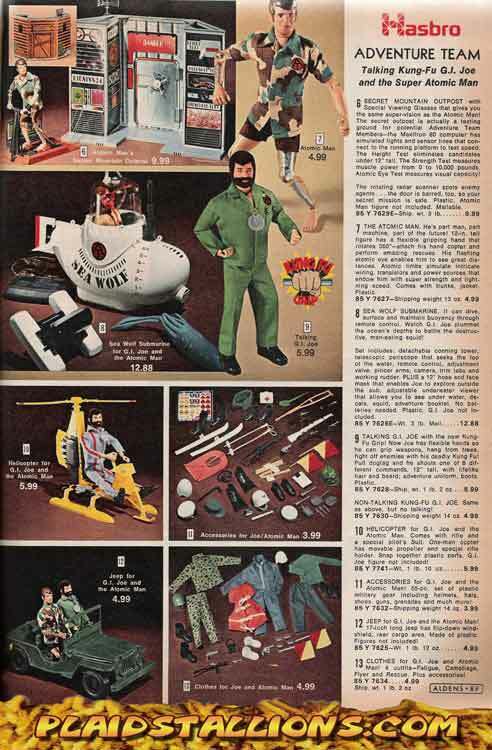 The 1978 Kenner Catalog is a prime example featuring some classic goodies and a few that just didn't make it under anybody's tree that year. 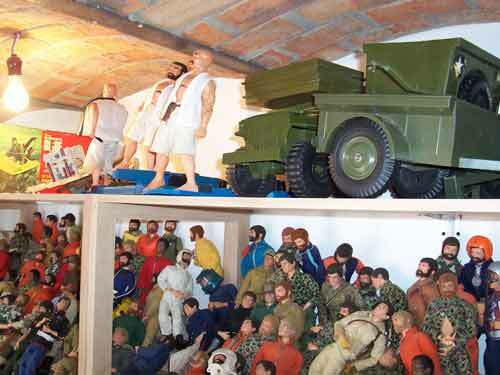 Bionic Woman, Play Doh, Star Wars, Finger Pops and much more. 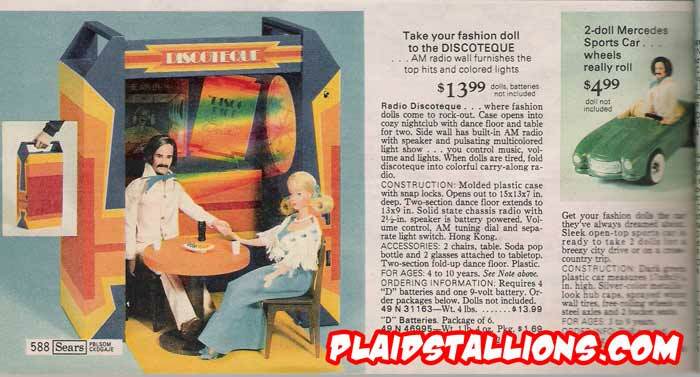 This disco playset probably looked a whole heck of a lot more innocent back in the day, now the guy figure looks a lot like Eric Roberts in "Star 80". I cut it off but you can see his "Mid life crisis mobile" which was sold separately. This isn't just green, it's GREEN! The kind that holds you down and beats you until you magically become Irish. The checked number in the middle is so bad, it's kind of cool. Janex is probably best known for their Batman and Robin talking alarm clock which was a big hit. 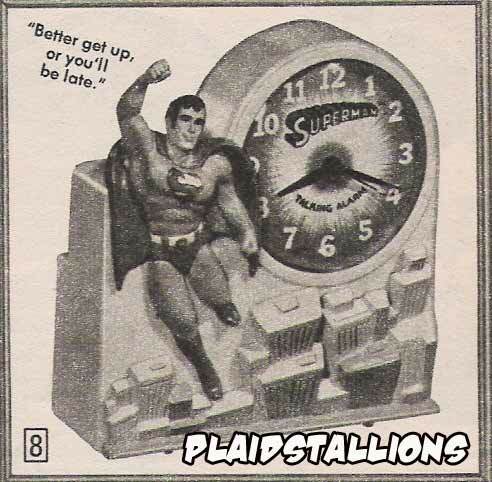 Their Superman clock is lesser known and no wonder, while Batman and Robin started your day with their snappy " Hey Chum and Holy This!" banter, Superman seemed to just nag you. I mean "Better get up or you'll be late"? This is the man of steel! This paints Superman as the sort of guy who buys kids "slacks" for Christmas. Dressing alike continues to boggle my mind, one stumbled upon reviewer claims it had to do with the rise of the liberated woman and that men would be forced to do such things in order to get with a girl. It's not a stretch for me to believe, heck i could see a young version of myself going for that but I still think dressing up like a clock you'd find at a flea market hurts both of you. Continuing the syndicated adventures of the Starship Enterprise, I'll be keeping the previous entries on the site in a new archive. By the late 1970's, Remco was making a heroic amount of comic book merchandising including logical items like the CSF BatCopter and inflatable Hulk muscles to the truly head scratching stuff like the Hulk Helicopter and Spider-Man pistols. 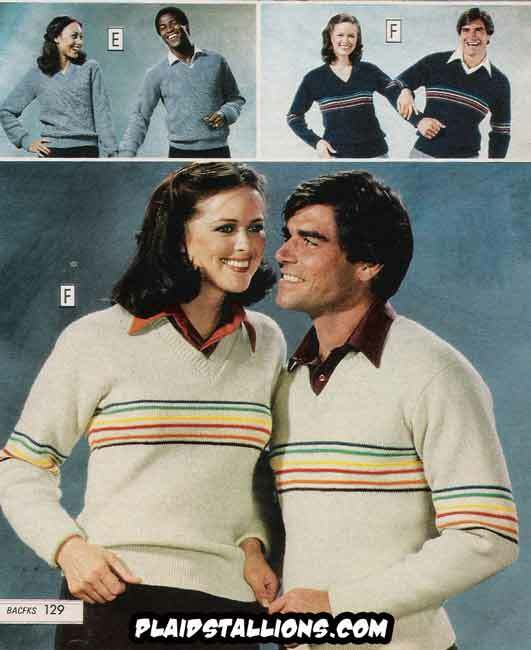 Check out the 1979 Remco Catalog. "Run! The Bass player from the Hives is a giant!" 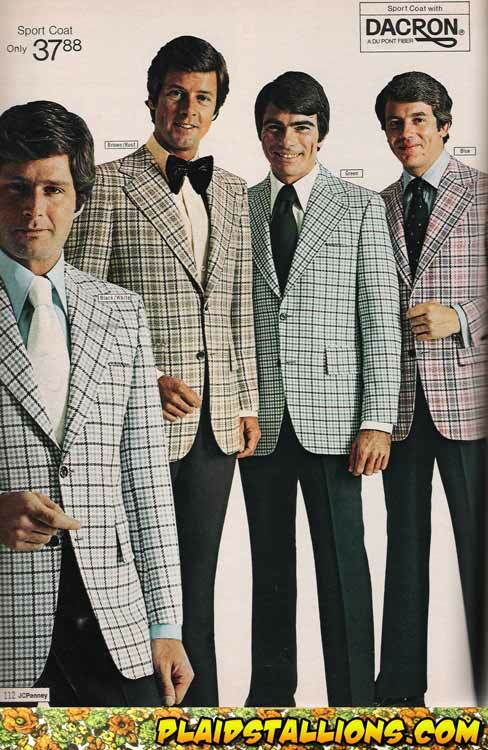 These Sears kind of look like uniforms from a 70's reluanch of the Prisoner televions series. Darth Mall and an appearance by the Incredible Hulk! Two more additions to the Plaidstallions Mall Appearance Gallery today and they're both pretty fantastic! 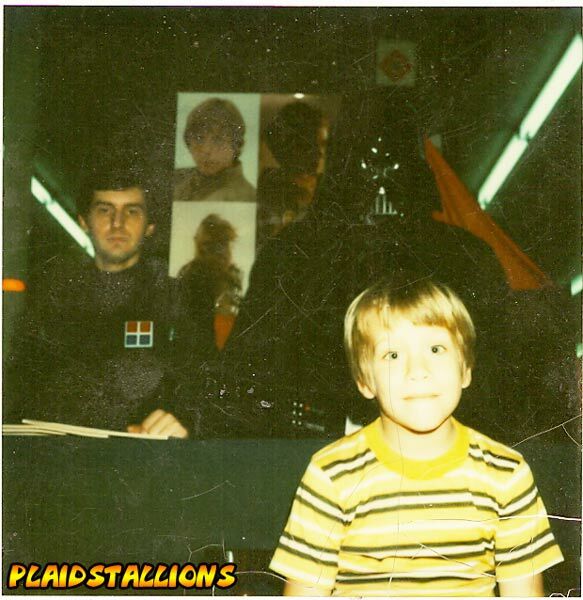 Daniel Preston sent in this fantastic pic of Darth Vader at the Mac Dade Mall Woolco in PA, Vader choked that Imperial officer when his marker ran dry. 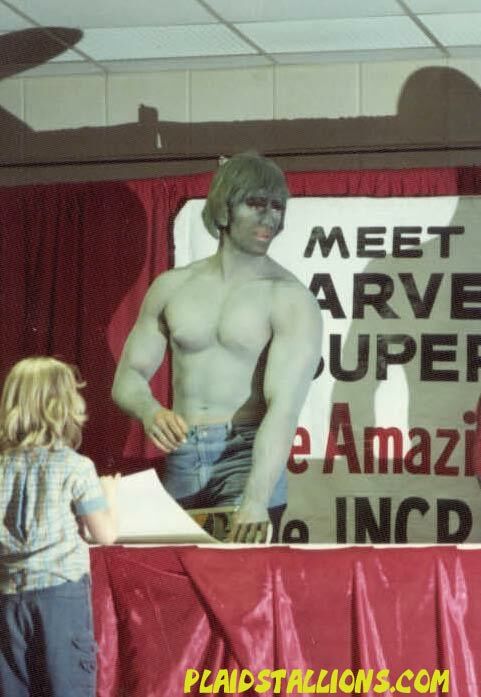 Mark ( AKA Vulcanjedi ) sent in this wild Incredible Hulk Appearance at the 1979 Philadelphia Car Show, also in attendance were Eric Estrada and Scott Baio, hopefully he can find those pictures. 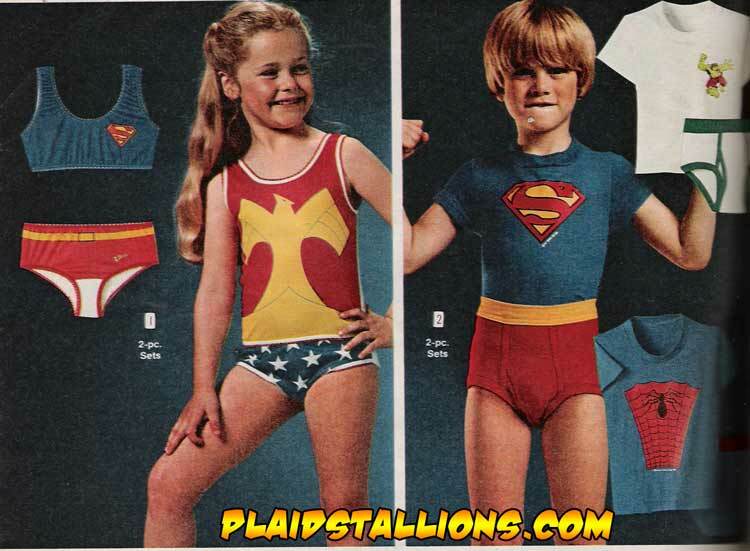 I can still remember the first commercial I saw for Underoos, during the Plastic Man cartoon, your underwear could make you Superman, Darth Vader and even the Dukes of Hazzard! I was sold but never saw them in stores growing up (My mum was a "Marks and Sparks" shopper). As an adult a friend gave me a Shazam! set as a joke. I seem to recall a very tall and thin friend trying the shirt on at a party. My son wears that Shazam shirt to this day. Mike Power had a big impact on me as a kid, he beat the Six Million Dollar Man to market by a few months and he was a pretty big deal on the play ground. 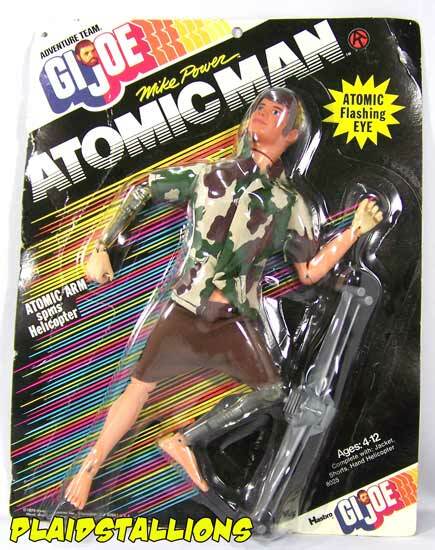 He was of course, pretty much forgotten once Steve Austin lumbered onto toy shelves. 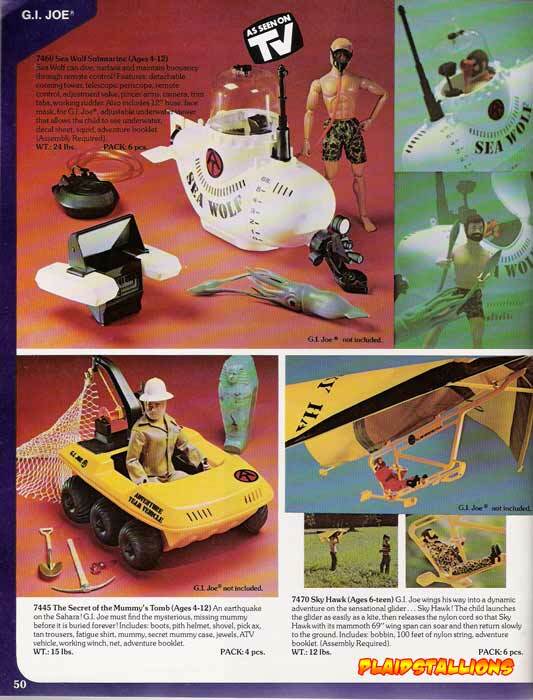 The Sea Wolf Submarine, also seen on this page is a fantastic toy, a working submarine you can put a Joe into and it comes with a "giant" Squid! 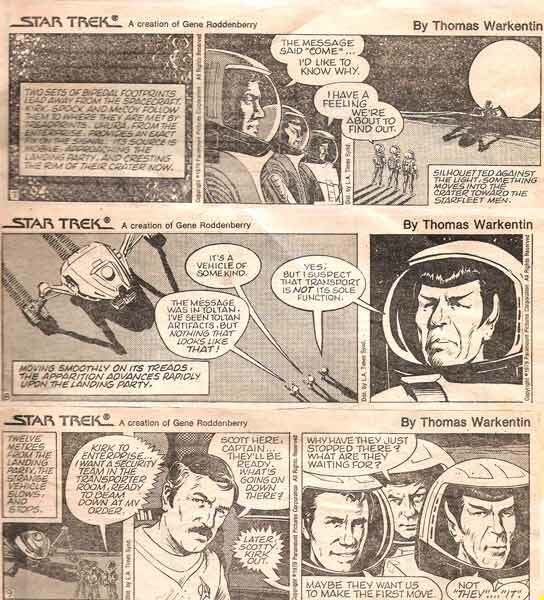 In 1979, a Star Trek daily comic strip appeared, tied into "Star Trek : The Motion Picture". What's weird about this is I somehow clipped and pasted an entire story into a scrap book as a kid, eventhough I have no recollection of doing so. 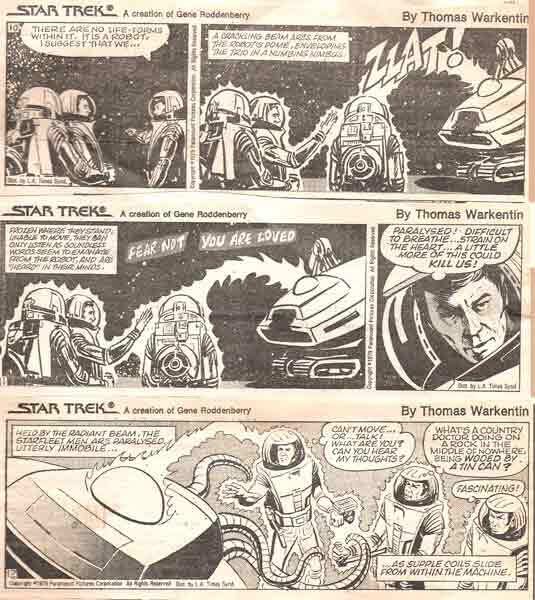 It does make sense, as a kid, I was really into the Gold Key and later Marvel Trek comics. So, for the next few Saturdays I'm going to post installments of this remarkably well drawn story. 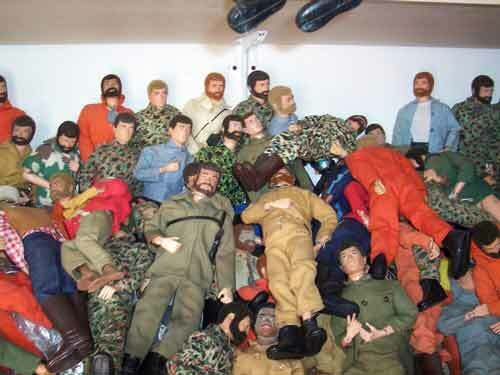 Kenner's Steve and Bob Scout line was an answer to other "Razor and razor blades" adventure lines like Big Jim and G.I. Joe but with a sharp focus on being wholesome. 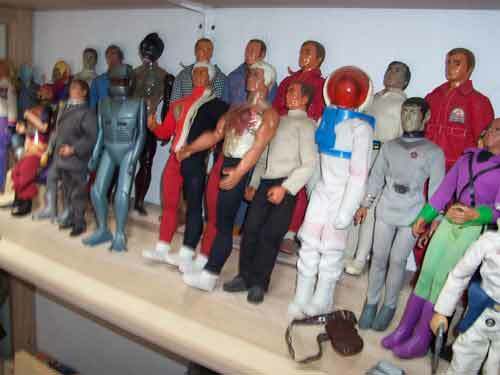 Steve and Bob were 9" Mego like figures that had well made outfits and accesories. Visit the Plaid Stallions Steve Scout Gallery for more pictures and info. Yes, you are reading that correctly, it says "Overalls in a HEE HAW print" as in that show that was on opposite of Lawrence Welk. Was this show popular with the playground crew? Wearing these where I grew up would be the equivilant of being caught dressing up my cats. Not available in "Junior Samples" size. 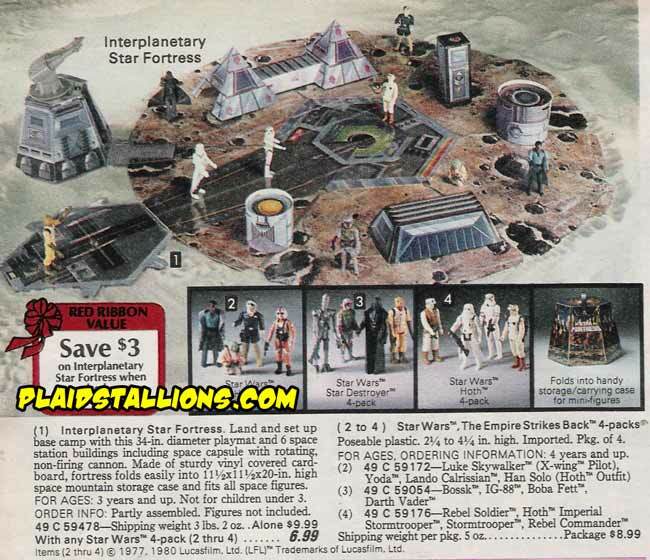 I really dig unlicensed catalog play sets like this star fortresss. I'm sure that more than a few grandmothers were fooled into thinking this was a death star. I've never seen one but it looks to be entirely of laminated cardboard, I wonder how many survived? Also as a Star Wars nerd, the concept of Yoda, Lando and Hoth Han teaming up against Vader, Fett, Bossk and a whole lot of Storm Troopers reminds me a lot of 1981. 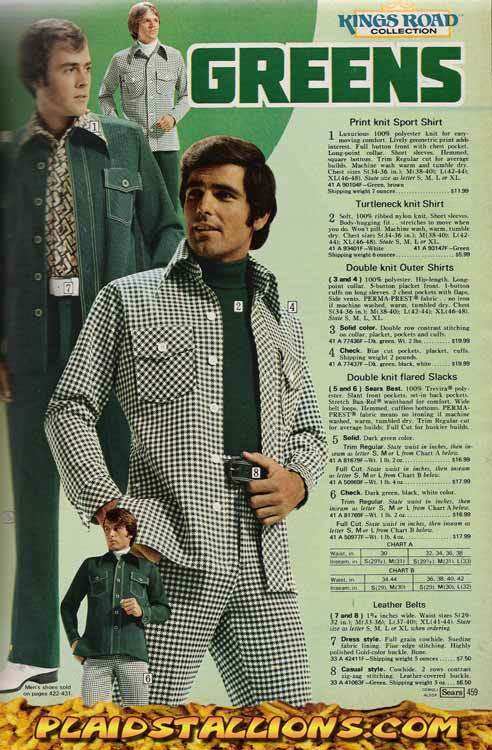 Sadly, my Sears has no "Style Aisle" as this 1977 Catalog advertises. Which is a shame because that yellow shirt is just about the greatest thing ever. 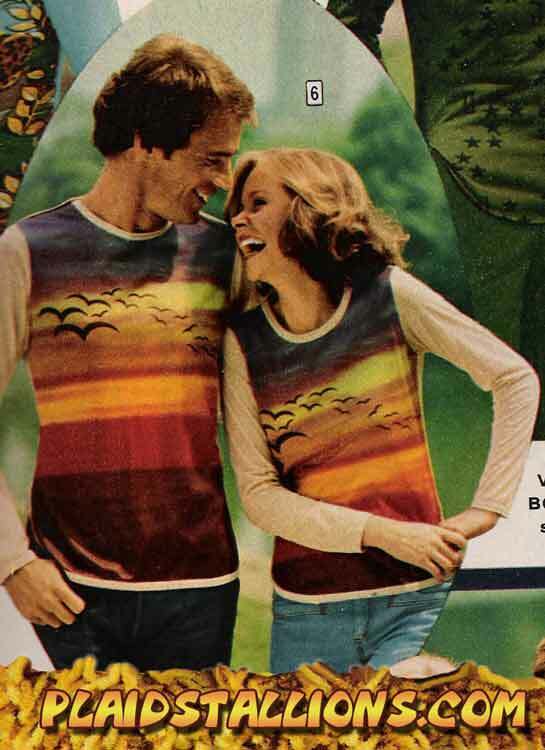 These "lovey dovey" dress alike photos always look ackward and somewhat stilted, apparently personal space hadn't been invented in 1979. My Pal Jesus sent me an email full of pics of incredible 300 figure plus G.I. 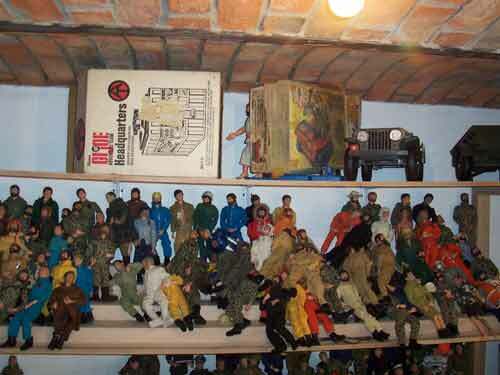 Joe collection and mentioned to me that it's for sale. 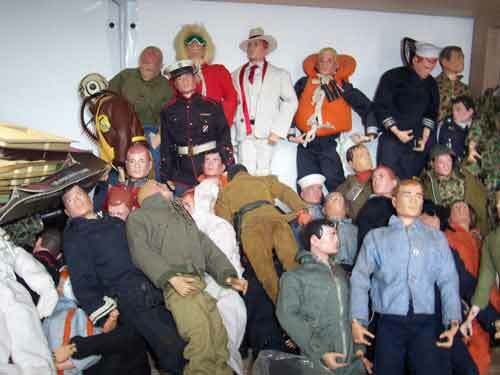 He has Joes from all over the world, Italy, Canada, Spain and most of all, Mexican Lili Ledy Joes which are different from US versions. I've had dozens of dealings with Jesus over the years and can vouch for him as an honest and dependable trader, he'd be in my top ten. If anyone is interested, get in touch with me and I can forward yout info on and if you have a collection you want to showcase here, let me know. It doesn't have to be toys, it can be anything 70's related and it doesn't have to be for sale. 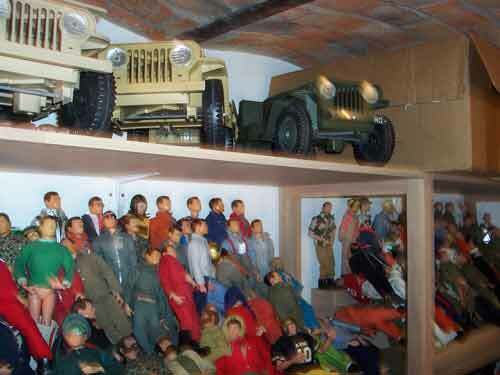 I'd like to do a "Cool collections" week someday. Who doesn't love a clip show? 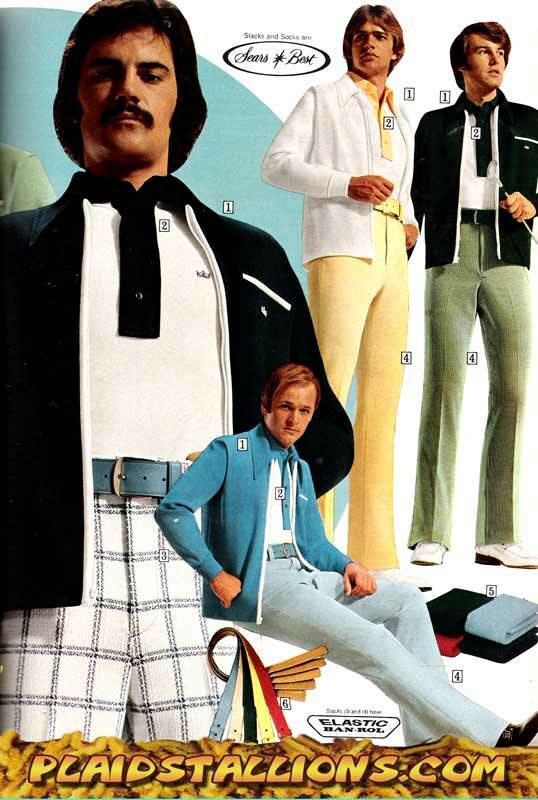 After more than a year and a half of blogging about polyester, it seemed fitting to put together a "Greatest Hits" packageof some of the bigger fashion attrocities of the 1970's. 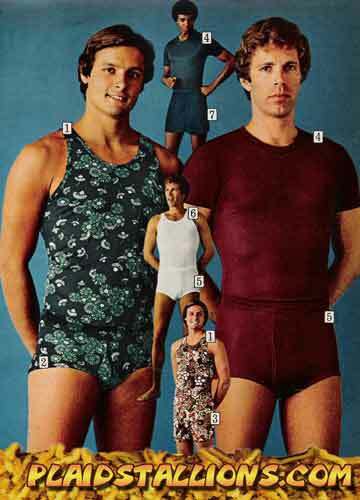 Thanks of course, to the good catalogs at Aldens, JC Penney, Sears and Wards. 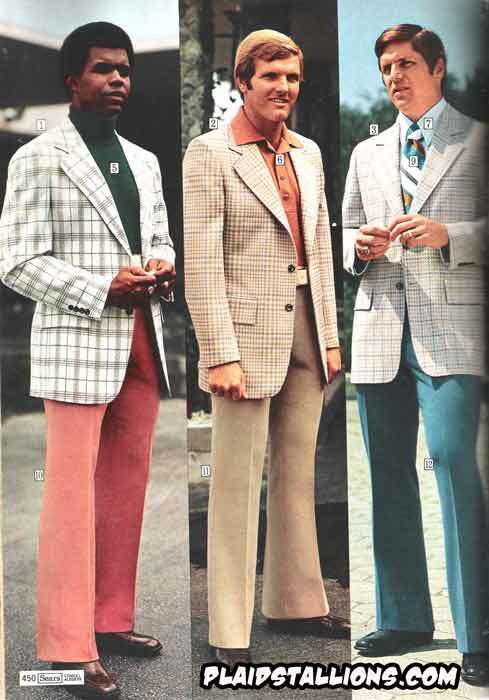 So check out the best of Fashion Mockery for the finest in ugly shirts, dress alikes, Furhley wear and of course, Mantooth. 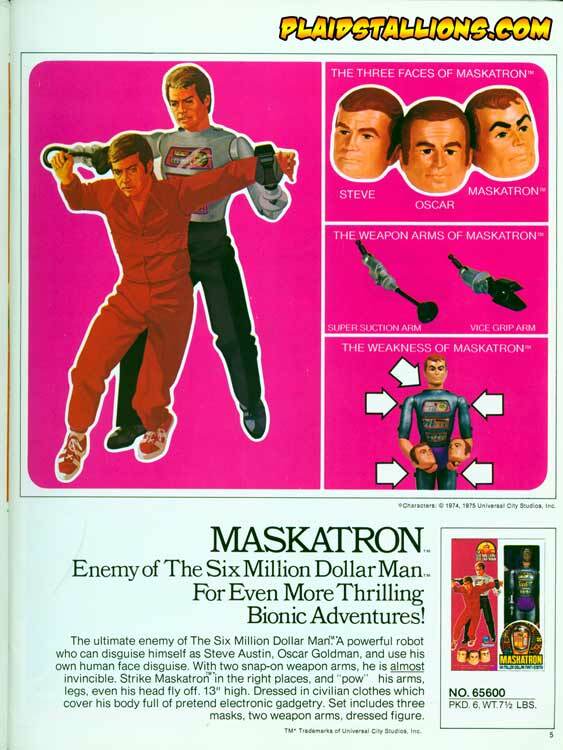 New to the web today is the 1976 Maskatron commercial from Kenner. 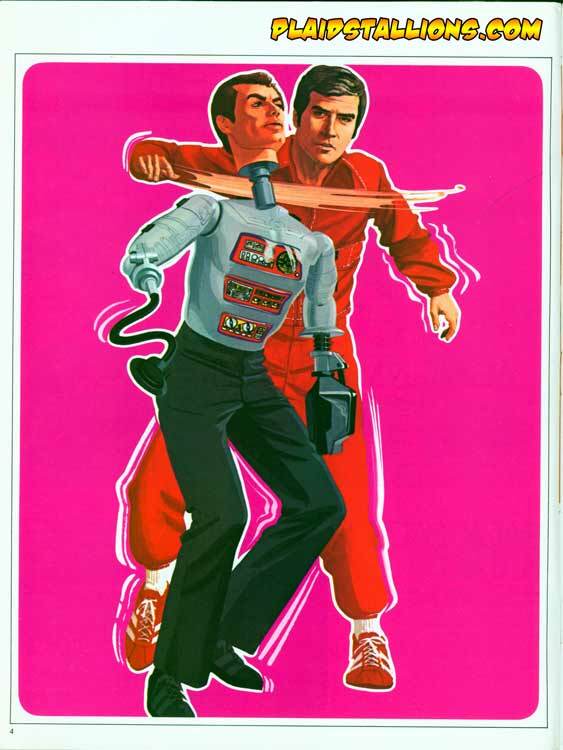 Every child should know the joy of owning a robot doll that becomes John Saxon. That's not sarcasm, I really mean it! These are scans from the 1976 Kenner catalog, click on the link for more. Expect more Bionic Man and Woman stuff in the new year. It's been too long without some fashion mockery and while these gents score high for truly being "Plaidstallions", they lose points for not having their belts match their shoes.